So you want to stop climate change? All right: here’s 65 million years’ worth of climate change—stop that! Click for larger version. Grow up and see how the world really works—how, in the past, temperatures were higher than today. So we made it through; who would have thought? 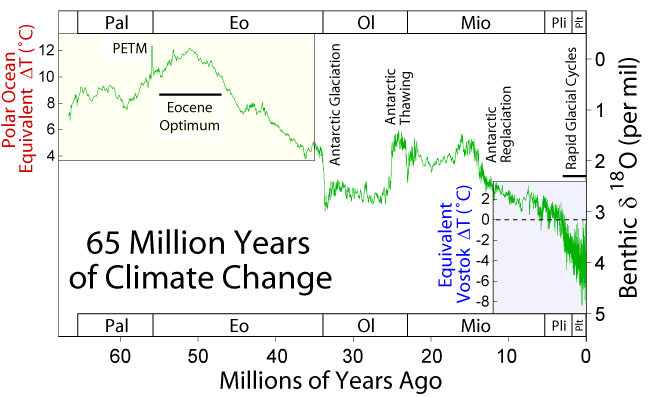 Multiple lines of scientific evidence show that climate change is happening, and humankind’s emissions of greenhouse gases are very likely the cause. Since the 1970s there is mounting scientific evidence that increased concentrations of greenhouse gases in the atmosphere from human activities are raising temperatures and changing the Earth’s climate patterns. These activities include burning fossil fuels like coal and oil, deforestation and farming. Atmospheric concentrations of greenhouse gases such as carbon dioxide, methane, and nitrous oxide, increased markedly over the 20th century.